Ethereum ETH/USD ends the trading week at 104 and continues to move as part of the correction. Moving averages indicate a downward trend. At the moment, we should expect an attempt of growth and a test of the upper boundary of the downward channel near the area of ​​125. Where should we expect a rebound again and the continuation of the fall of the Ethereum rate with a potential target below level 55. 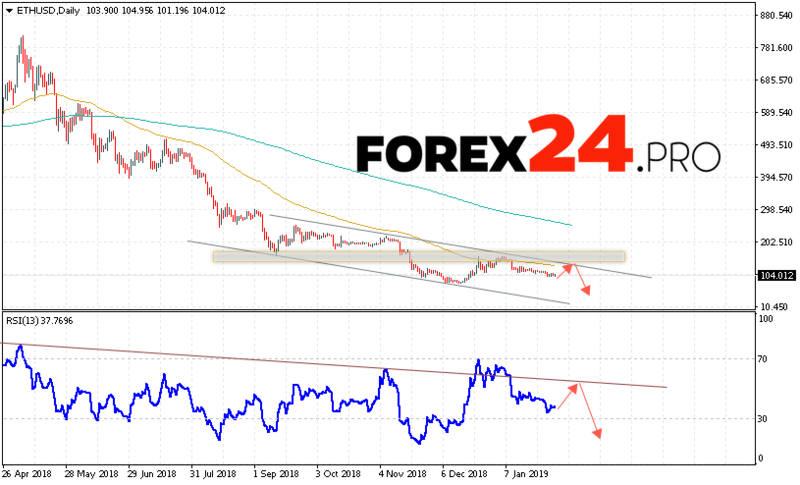 The test of the resistance line on the relative strength index (RSI) will be in favor of the drop in ETH/USD quotes on the current trading week of February 4 — 8, 2019. Cancellation of the fall option will be a strong growth and a breakdown of level 165. This will indicate a breakdown of the upper boundary of the channel and continued growth of ETH/USD with a potential target above level 225. Confirmation of the fall of cryptocurrency Ethereum will break the support area and close quotes below level 95. Ethereum Forecast and Analysis February 4 — 8, 2019 involves an attempt to test the resistance area near the level of 125. Where should we expect a rebound and continued cryptocurrency decline in the area below 55. An additional signal in favor of reducing Ethereum will be a resistance test on the relative strength index (RSI). Cancellation of the fall option will be a strong growth and the breakdown of the area 165. In this case, we should expect continued growth.